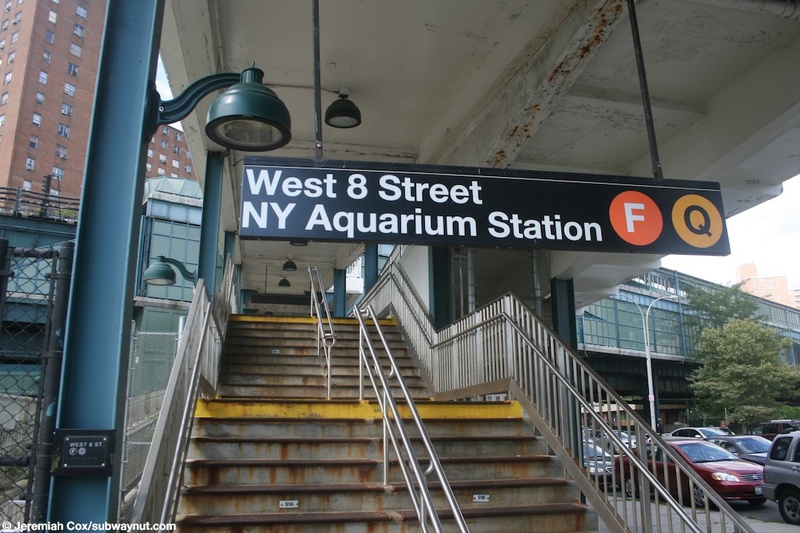 West 8th Street-NY Aquarium is one of the most unusual Subway Stations. The station has four platforms (all side), for four tracks on two stacked levels. 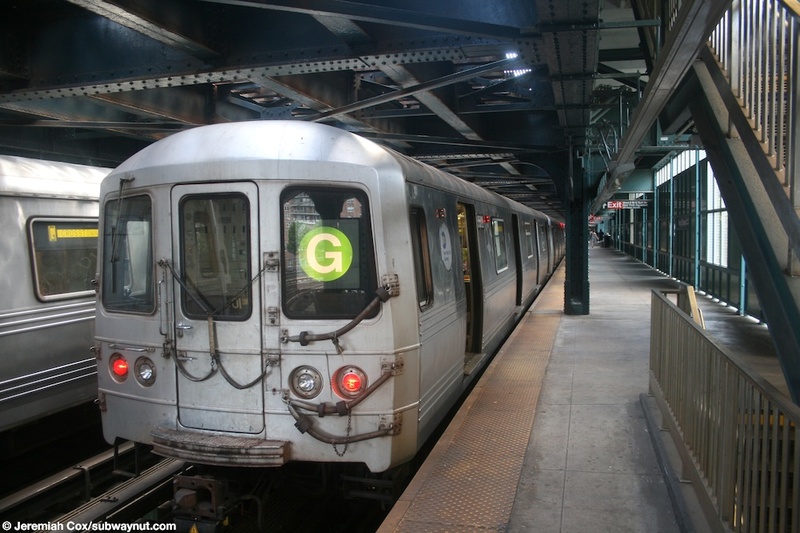 The upper-level is used by Brighton Line Q trains, and the lower by Culver Line F trains. Just east (railway north) of the station the Culver Line sharply curves north, leaving the stacked configuration, the Brighton Line stays on the same straight path a bit farther before it begins heading in the correct direction to reach Manhattan, and curving north, beyond the Brighton Beach Station. 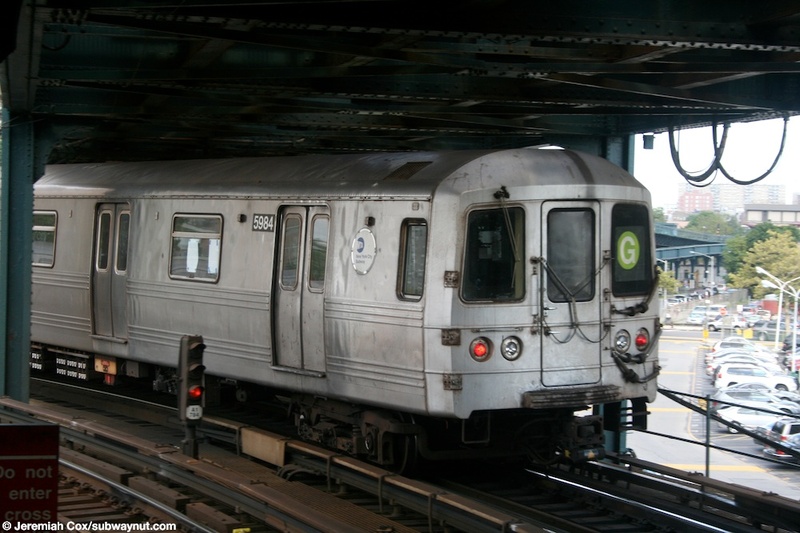 The two trains continue together, stacked for before they unstack just before entering their terminating tracks that are level with each other in the Coney Island-Stilwell Avenue Terminal (only a quarter mile away). 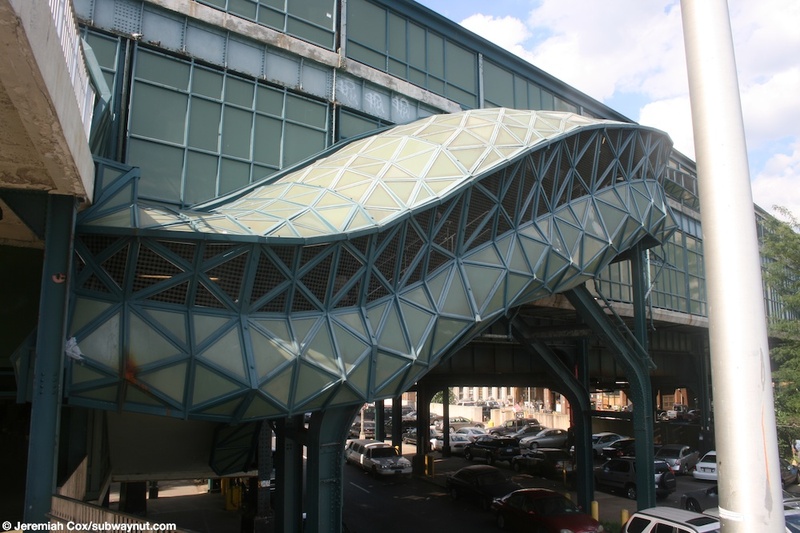 The station itself was completely rebuilt at the same time as the Coney Island complex, and was an Arts For Transit artists-architect collaboration (so no separate webpage for this station, the MTA's explanation is here), and is called Wavewall, 2005, by Vito Acconci. 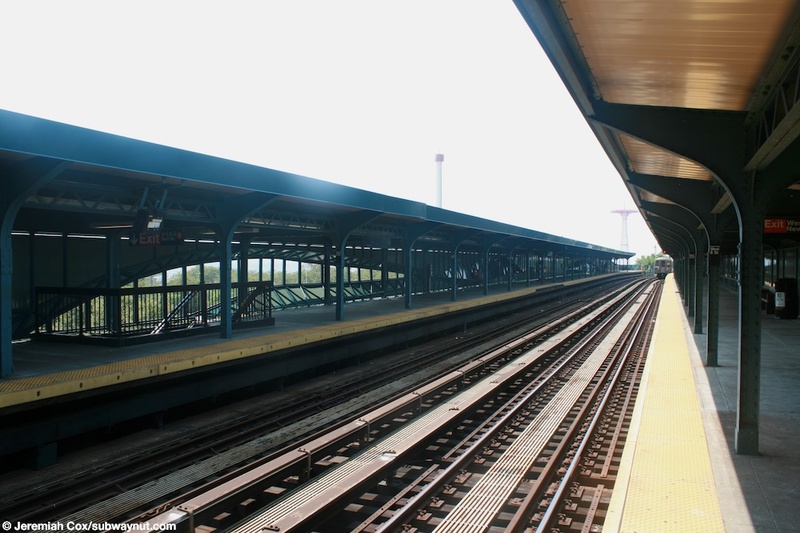 This means that the windscreens of the Manhattan-bound platform (these face south, and the boardwalk and ocean), are not simply square windsceens with clear definitions of where they begin and end, but more fluid looking, curves, and waves. 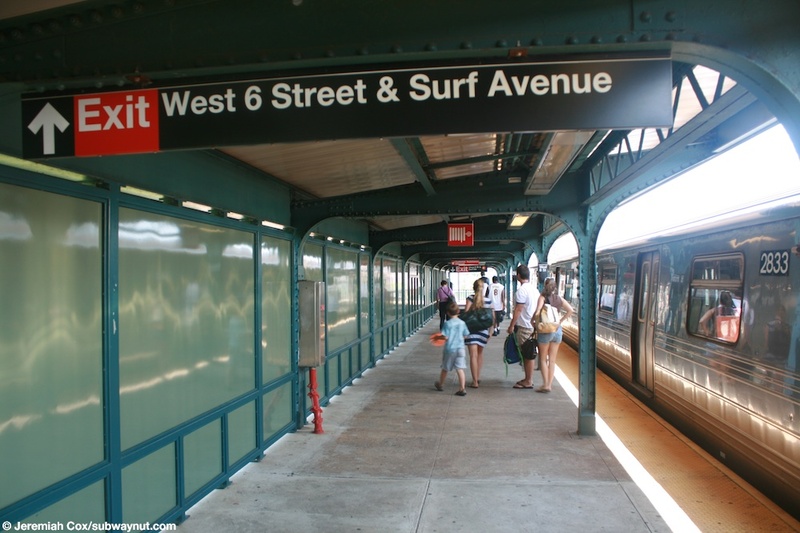 There are many places where these windscreens are interrupted (on both station levels), and become a wire mesh that allows waiting passengers to have a view of the ocean as they wait for their train to whisk them back to Manhattan. 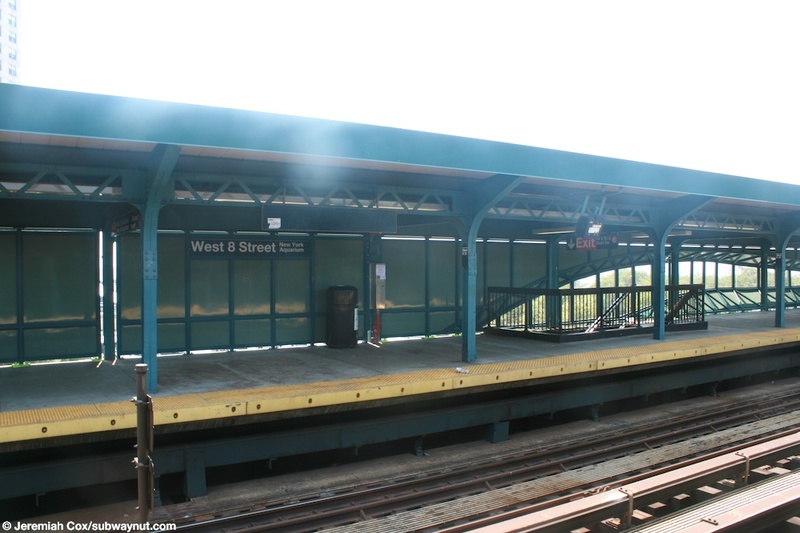 The walls/windscreens of the north facing, Coney Island-bound platforms are standard rectangles but there are still many sections where it becomes mesh, allowing views of the surrounding area. 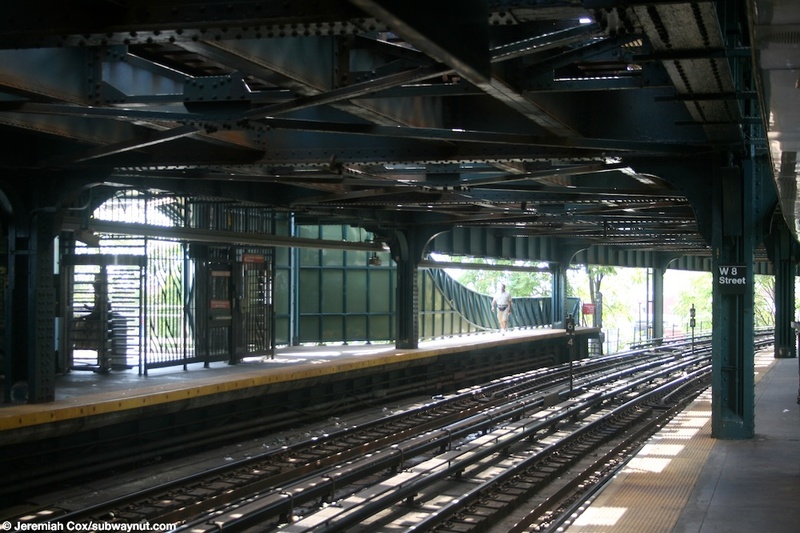 Although the Lower-level F Culver Line platform has the disadvantage of not being completely exposed to the elements, there is still quite a feeling that your outside in the form of lots of natural light that pokes its way in through the wire-mesh openings as well as down and through the Brighton Line Trackbeds that are simply steel trusses. All-in-all the Culver Line platforms provide for some very interesting shadows that are hard to capture in an image. In terms of exits for the station itself there are two at either end of the station. At the eastern (northern) end of the station is a secondary entrance that leads to what is signed as West 6th Street and Surf Avenue, but is what is in reality, really in the middle of no public street at all, just paths beneath the elevated structures (that are on there own ROWs for the station), one continues north beneath the Culver Line's Structure, Neptune Avenue (and where that station is) is the next public street. The other beneath the Birghton Line's to West 5th Street, and to where West Brighton Avenue begins as a street that for Brighton Line to fallow. 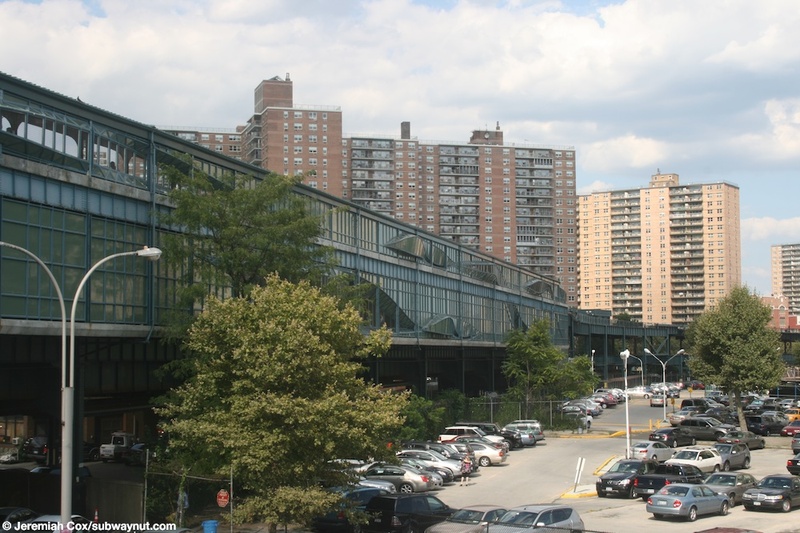 Both of these walkways are across NYCT property as signs on the beams of the elevated say, but various employees park their personal vehicles along them. There are also barbed wired off parking lots on all four sides of both paths its one of the stranger locations of a subway entrances. This exit through is right next to a subway substation that hasn't changed at all recently. It even still has the 1960s interlocking TA logo on it. 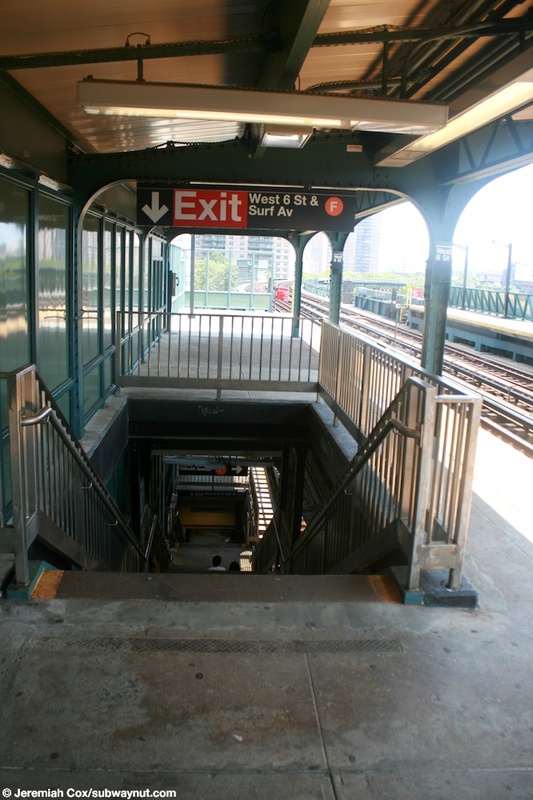 For access to the platforms, relatively short staircases lead up to doors into a small station house, and two High Entrance/Exit Turnstiless, and two High Exit Only Turnstiles, provide means of entry and egress into the system. To reach the platforms two staircases lead up to each lower-level Culver Line platform, with a second single staircase up to the upper-level Brighton Line platforms. In addition there is an escalator directly up from this station entrance up to the upper-level Birghton Line platform. 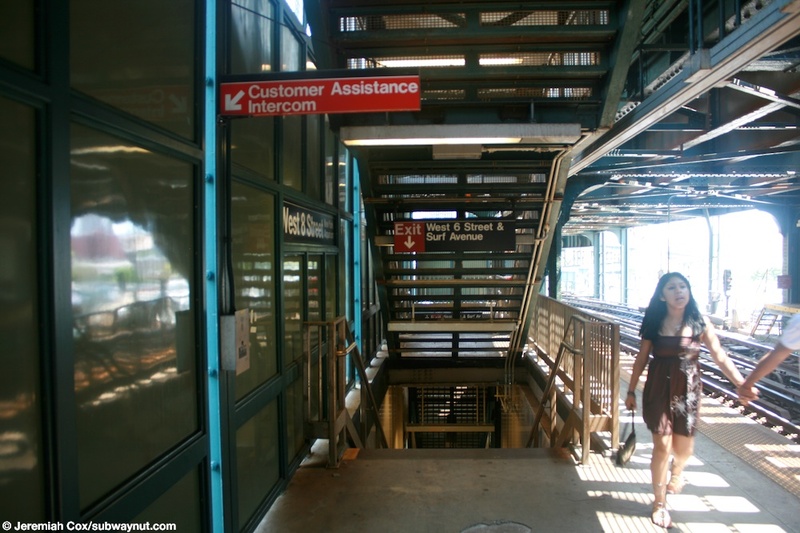 Not surprisingly, the only staircases between the upper and lower platforms are near the station's exits because there's no reason people need to transfer between trains going the same direction (some might want to switch from Coney Island-bound trains to the Manhattan-bound train of another line). The main station entrance at the western (southern) end of the station mostly provides access to the pedestrian bridge across Surf Avenue that in turn leads above a couple more parking lots before reaching the Boardwalk right at the entrance to the New York Aquarium. There is signage for the station along this bridge, as well as on the staircases up to it on eitherside of Surf Avenue. 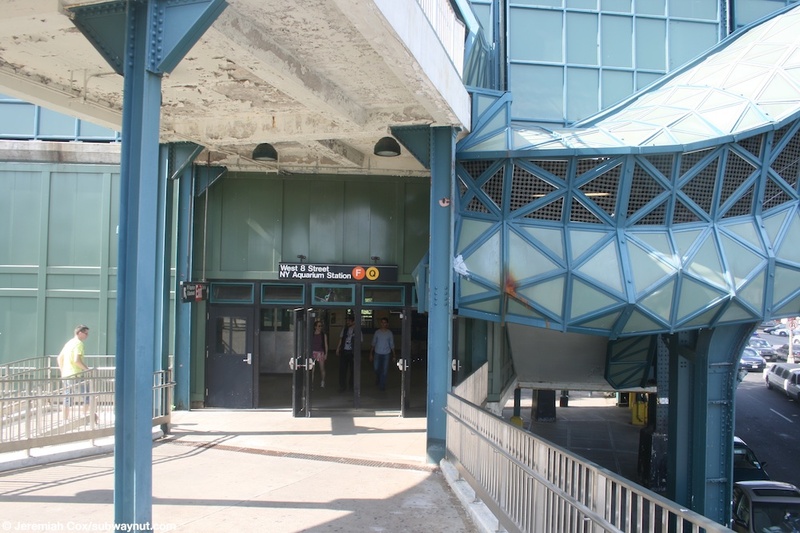 As the bridge gets closer to the station (just after it cross Surf Avenue) it splits with half of it ramping upward to two High Entrance/Exit Turnstiles that are directly on the Manhattan-bound F train's platform. The other half of the bridge angles downward to the main station house that is located directly beneath the tracks, maybe 10 feet above ground level, and is along the Western side of West 8th Street, where there is another staircase up to the station house on the north side of the subway ROW. This entrance is fully staffed with turnstiles and the station's only token booth. 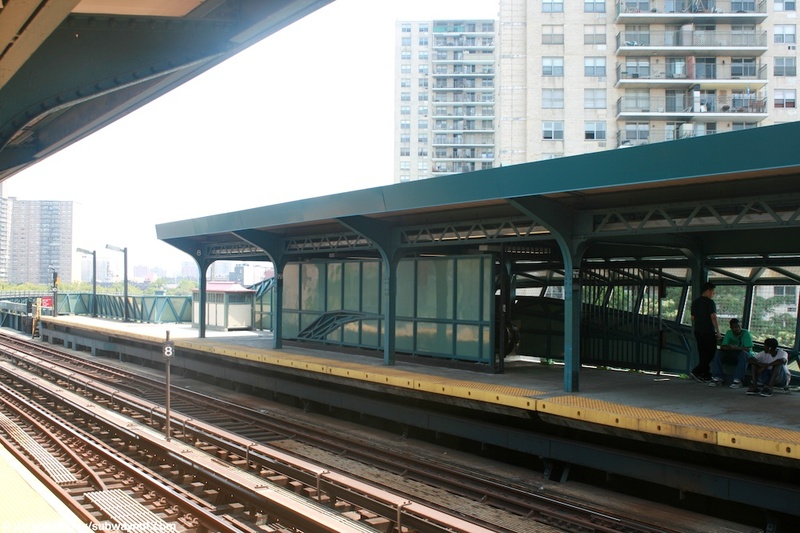 Single, wide staircases lead up to each lower-level Culver Line platform, with two staircases continuing up to the upper-level Manhattan-bound Brighton Line platform and one up to the Coney Island-bound platform. (w_8_ny_aquariumf1) R46 #5502 and the rest of a Coney Island-bound G train stops at West 8 Street-NY Aquarium, there extended to Coney Island replacing F trains because of weekend construction. 17 August, 2008 (w_8_ny_aquariumf2) R46 #5984 and a Queens-bound G train leave West 8 Street-NY Aquarium, they've been extended to Coney Island replacing F train service. 17 August, 2008 (w_8_ny_aquariumf3) Looking down the Coney Island-bound lower-level F train platform at West 8 St-NY Aquarium. (w_8_ny_aquariumf5) The main entrance doors from the bridge across to the boardwalk at West 8 Street-NY Aquarium. 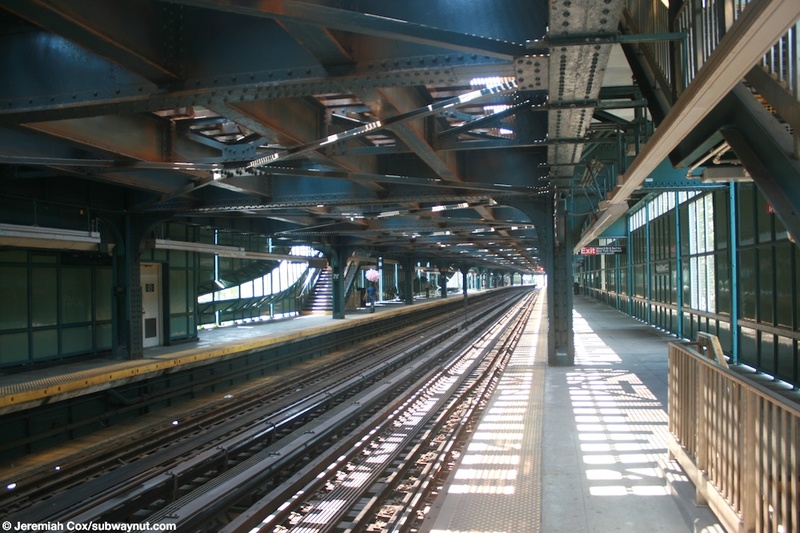 The ramp that leads directly up to the Manhattan-bound F train's platform is above. 17 August, 2008 (w_8_ny_aquariumf6) One of the staircases that is inside West 8 Street-NY Aquarium, has been designed to made it look like a tubular wave structure. 17 August, 2008 (w_8_ny_aquariumf7) Looking back at the two entrances from the boardwalk to the West 8 Street-NY Aquarium Station, the inspiration of Wavewall, that gave the station the unusual non-rectangular platform walls is clearly visible. 17 August, 2008 (w_8_ny_aquariumf8) The entirety of the exterior walls of the Manhattan-bound platform West 8 Street-NY Aquarium, Wavewall's fluid connection of artwork and architecture is clearly visible. 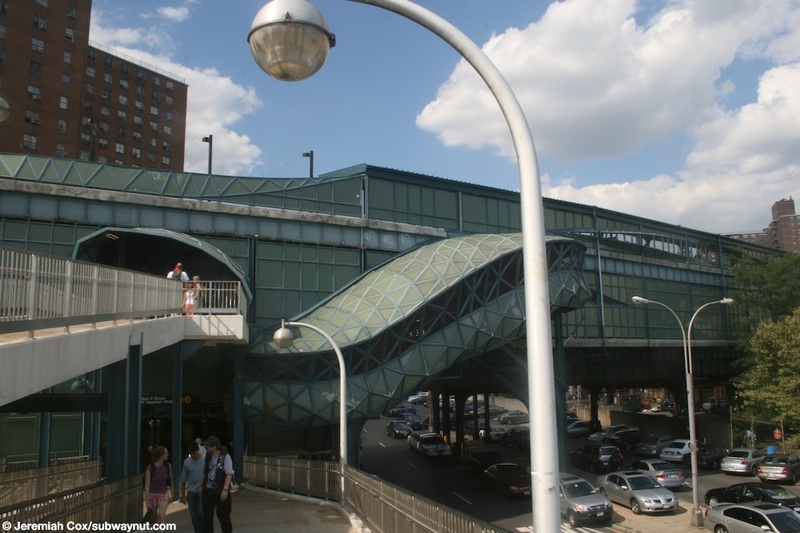 (w_8_ny_aquariumf9) The bottom of the main entrance staircase from Surf Avenue to the West 8 St-NY Aquarium Station. 17 August, 2008 (w_8_ny_aquariumf10) Looking down the Upper Level Coney Island-bound Brighton Line platform at West 8 Street-NY Aquarium, a R68 Q train has just finished its quick stop and closed its doors. 4 August, 2009 (w_8_ny_aquariumf11) Looking across at the Upper Level Manhattan/Brighton Line-bound upper-level platform at West 8 Street-NY Aquarium, one of the few staircases down to the lower-level platform and the station's exits is visible. 4 August, 2009 (w_8_ny_aquariumf12) Looking down the Upper-level Brighton-bound tracks at West 8 Street-NY Aquarium. the Parachute Jump, and the AstroTower, two amusement rides that are no longer in use, are in the background. 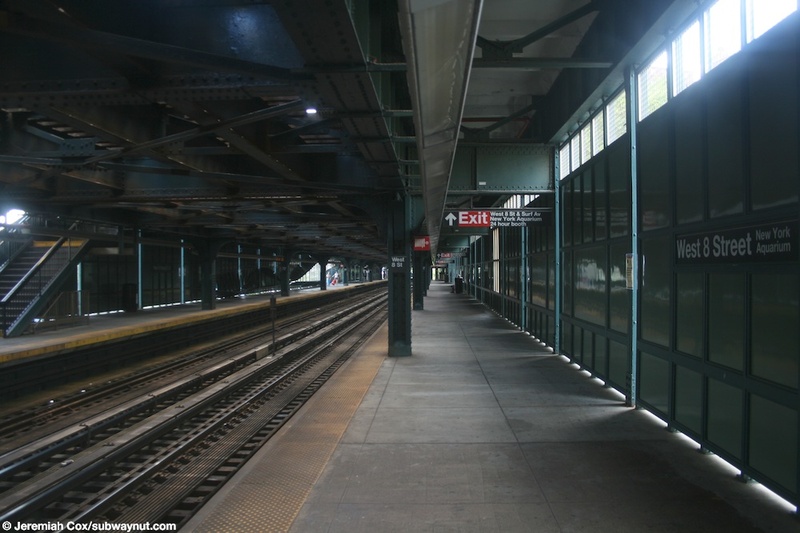 (w_8_ny_aquariumf13) A view across to the Upper Level Manhattan/Brighton-bound platform, where the upper landing of the up only escalator that leads up from the West 6th Street entrance to the station is visible. 4 August, 2009 (w_8_ny_aquariumf14) The staircase down from the Coney Island-bound upper-level track to the lower-level and beneath it to street level at West 8 Street-NY Aquarium. 4 August, 2009 (w_8_ny_aquariumf15) Looking down the lower-level for the Culver Line at West 8 Street-NY Aquarium. 4 August, 2009 (w_8_ny_aquariumf16) One of the two staircases down to the West 6 Street part time exit from the lower-level Coney Island-bound platform at West 8 Street-NY Aquarium.